The Chef, Luciano, recommended a dish. It was fantastic! The owner stopped by our table and welcomed us to his restaurant. 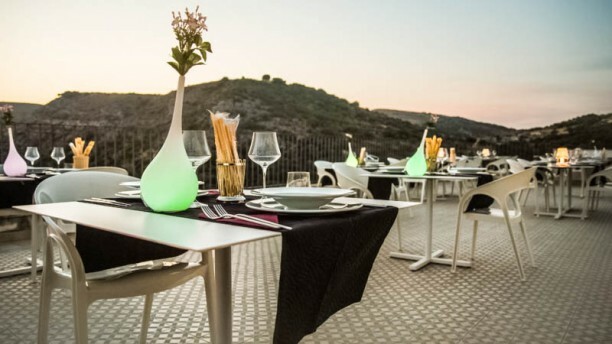 If the weather permits, eat on the terrace, beautiful panoramic views of Ragusa! Second time at restaurant. They only presented pizza menu; not the normal menu. Other tables got the regular menu. Very disappointing. They also charged us €2 more per pizza than the menu price. Rip off. Bella location, buon cibo e personale gentile e disponibile. Torneremo in estate, per cenare ammirando la splendida vista su Ibla dalla terrazza! Very good ingrédients, nice atmosphere and good service. Spaghetti tuna almonds and mint amazing. First disappointing meal in Sicily. Fried Ragusan cheese was tasty but poorly presented. Pasta with Gorgonzola, radicchio, and walnut sauce was average but too salty. The Fritto Misto was the biggest problem. While the little fishes were fine, the calamari and shrimp were heavily breaded and overcooked losing their sweetness and tenderness. The waiter seemed apologetic and brought us a complimentary glass of traditional liquor after the meal. Me and my sister went to celebrate her birthday at this restaurant. Its great just make sure you are not in high heels to get there as there are a lot of stairs and also cobbledground. The food was excellent!!! I would go for the pizza it was amazing. Dishes are quite normal, not special. But the terrazza for Ragusa Alta is very beautiful, romantic. It’s good for couples. All very welcoming and friendly with a traditional menu. We got there way earlier than our reservation in the hopes of having an aperitivo before dinner. They let us in and treated us so well, even though the restaurant wasn’t even open yet. Get the mixed appetizer plate- the olives they make are incredible. The staff is warm and welcoming, the food is delicious and the view is fantastic. I’ll definitely be back! Everything about the restaurant was excellent apart from the actual position. The food was very good, the servcie friendly and efficient and the views from the dining area amazing across the valley to the other part of Ragusa. The slight criticism I have is the the setting is on top of the roof of the hotel/restaurant and does not have a "restaurant" feel about it ie just tables placed on a flat roof. I think they could do more to create a better atmosphere. Despite my comment I would still return because of the food, the service and the view.